There are roughly 4,000 “hog-waste lagoons,” that is the official term folks, in North Carolina. In the aftermath of Hurricane Florence, the North Carolina Department of Environmental Quality today says a number of these pork poo ponds are at risk of flooding and overflowing. 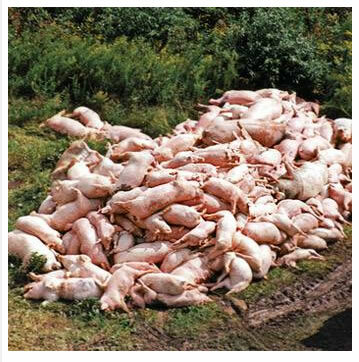 We've written before about the giant lagoons of pig excrement that explode without warning on pork farms, and you may know they have killed a man more than once. More bad news from Hurricane Florence's wake: many of those poop ponds are overflowing or at high risk of overflowing in North Carolina. At least two hog-waste lagoons in North Carolina have been breached, two others have been damaged, and several others have overflowed and flooded due to Hurricane Florence, raising activists' concerns about health and environmental hazards. The two lagoon breaches occurred on farms in Duplin County and Sampson County, Megan Thorpe, a spokesperson for North Carolina Environmental Quality (NCER), told BuzzFeed News on Tuesday. Two others have structural damage, but the extent is unclear. At least 13 other swine lagoons have overflowed, nine are flooded, and around 55 are on the brink of overflowing, as of Tuesday afternoon, according to NCER. The breaches were reported two days after North Carolina Gov. Roy Cooper said that there were no reports of any issues with the state's approximately 4,000 hog-waste lagoons. This news contradicts what North Carolina Gov. Roy Cooper said on Sunday: "We are closely monitoring hog lagoons, and we haven’t had any reports of issues."